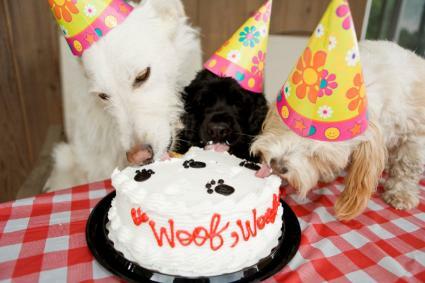 Want to whip up a birthday cake for your dog's next special day? Treat him with beef and bacon, carob and carrots, and special frosting he'll love. Bake in a 350 degree F oven for approximately 35-40 minutes, or until the center of the cake springs back when lightly poked. Oven times may vary. This naturally sweet doggy birthday cake can satisfy the chocolate-loving hound's taste buds without risking the toxicity from natural chocolate. Preheat oven to 350 degrees F.
Cream together the butter, oil, and eggs. Choose a frosting option from below or serve without it. Cream cheese: Whipped cream cheese is quite spreadable and tasty too. Just be sure to refrigerate the cake when you're finished decorating. Be sure your cake is completely cool before frosting. The great thing about baking dog cakes is that you are free to use ingredients you might not consider for a human's cake, and they're incredibly simple and quick to make. Meaty baby foods add protein and a flavor boost to any batter. Can you add bacon to a cake recipe? You bet, and your dog will flip for it. Get creative and your dog will love anything you cook up.